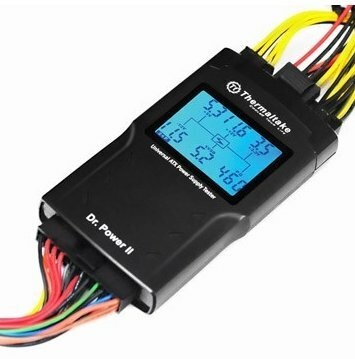 ThermalTake announced the Dr. Power II universal digital power supply tester. It's basically a simplified multimeter that shows if the voltages of a PSU are in check. Thermaltake Technology, a leading computer components and power solutions brand, is more than ever committed to create a uniquely innovative and adventurous enthusiasm of been "committed to creating the perfect User experience”. The New Thermaltake Dr. Power II Universal Digital Power Supply Tester designs for DIY enthusiast and PC gamers with a builder-friendly philosophy to enable you to test and diagnose the power supply’s condition before damage occurs. Further impressive features of the new Dr. Power II Universal Digital Power Supply Tester included oversized LCD panel that accurately shows the value of each specific power rails and sets the latest standard in fast, easy and accurate PSU Tester. With the innovative design and unique style, the Dr. Power II Universal Digital Power Supply Tester evokes the next-generation legendry and is the number one choice for PC DIY enthusiasts worldwide. Thermaltake Technology is eager to offer the perfect user experience and therefore design the product with excellent compatibility and flexibility for the users. The Dr. Power II Universal Digital Power Supply Tester particularly outstanding in this respect: supports every ATX power supply available today up to ATX12V v2.3 and also able to test every power supply output connector (SATA, PCI-Express, peripheral, Floppy and CPU connector) easily and accurately at the same time. With its manual/auto comprehensive testing flexibility, the Dr. Power II Universal Digital Power Supply Tester is a perfect addition for checking the health of your ATX power supplies. Despite so many options of the new Dr. Power II Universal Digital Power Supply Tester , for the user the decision is always very clear: the setting is made intuitively, and the programme selected is shown in the multifunction display as well as in very realistic, such as built-in alarm system and easily troubleshoots system etc. An intelligent feature includes it builds and upgrades fast and simple, thanks to the easy read oversized LCD panel and worry-free check button. It provides output connectors diagnostic system which easily for user to detect the exact cause of their power supply. Using an audible alarm system, the users will hear a beeping sound and the LCD will change from blue to red backlight or even no lights for critical checks. With the auto shutdown function, the Dr. Power II Universal Digital Power Supply Tester will automatically shut itself and the PSU down when it is in the middle of a test and no operation is performed. The new Thermaltake Dr. Power II Universal Digital Power Supply Tester which is exclusive to Thermaltake enables the development engineers to highlight and leverage optimisation refinement for the users, and to fulfill the mission of “delivering the perfect user experience”. The new Thermaltake Dr. Power II Universal Digital Power Supply Tester is now available from Thermaltake-authorized retailers worldwide in August, 2011.